The actress chats about her role as Rey, a Jakku scavenger, desert-planner dweller and warrior woman searching for her tribe in “Star Wars: The Last Jedi,” coming to theaters Dec. 15. 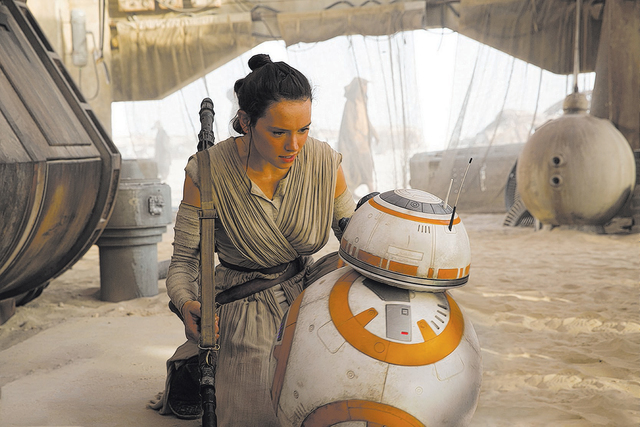 Daisy Ridley and Harrison Ford star in "Star Wars: The Force Awakens," now on Blu-ray and DVD. Daisy Ridley attends a special screening of "The Eagle Huntress" at the Landmark Sunshine Cinema on Thursday, Oct. 20, 2016, in New York. She’s a tea-sipping vegan who grew up with a father addicted to a certain space travel saga. Nevertheless, the proud papa and die-hard Trekkie made the trek to Ireland to visit his daughter, Daisy Ridley, on the set of a little movie called “Star Wars: The Last Jedi,” opening Thursday. That night he had dinner with his daughter and actor Mark Hamill, aka Luke Skywalker. There’s no mistaking Ridley, who has brought modern female power to the “Star Wars” universe as Rey, a Jakku scavenger, desert-planner dweller and warrior woman searching for her tribe in “The Last Jedi.” The cheerful, 25-year-old London native wields a mean lightsaber. “Mark Hamill jokes that I picked up a book called ‘Lightsaber Skills for Dummies.’ I think I’m more professional with a lightsaber this time around,” she said. Review-Journal: After a year spent in a galaxy far, far away how do you like to spend Sundays? Ridley: Relaxing! Give me a good book and a cup of tea with honey. If I’m in New York, I’ll go cycling through Central Park. Or maybe I’ll throw on an old pair of jeans and just go on a walk to a restaurant. That’s a workout, right? Have you ever visited a galaxy not so far away called Las Vegas? It’s so beautiful with all the bright lights and amazing shows. How does it feel to hold a lightsaber? It’s really heavy, so you feel the weight of the moment in so many ways. The first time it lights up each day, it truly is magical. I completely get why people live for “Star Wars.” It’s about unity and positivity. In a world of awful divisiveness, it’s wonderful that everyone can be brought together with a movie. Yes, it’s only a film. But, it seems like so much more to everyone. Are Luke Skywalker and Rey perhaps father and daughter? It’s funny, you want to give people some of the answers, but you know that they don’t really want them. As we do get closer to the release date of the film, it is exciting to feel the countdown to the answers, but I need to be careful. Can you say anything about Rey’s relationship with Luke Skywalker? When 2015’s “The Force Awakens” ended, Rey was on a cliff coming face-to-face with Luke for the first time. Talk about a cliffhanger. Now, it’s time to go deeper in Rey’s story. Rey has certain expectations as for what she might be getting from Luke. But as a lot of people know, it’s difficult to meet your heroes because it might not be what you expected. Is it hard to maintain this level of secrecy? Even I look at the trailers and think, ‘Oh God, they’re showing so much. The new movie is its own thing. It’s about how people collide and the consequences of every single person’s actions. What I can tell you is that Rey is on much more of an emotional journey this time. She gets to ask questions about herself and the world around her. She’s trying to figure out where she came from in this big, big universe. Did you feel the pressure of making this sequel? When you read “The Last Jedi” script, what were you dying to know? I think we’re all longing to hear Luke Skywalker’s first words. 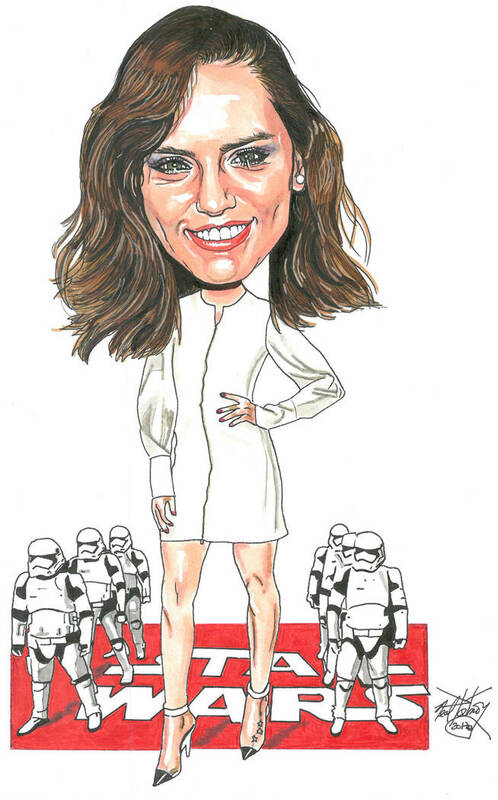 You’ve been credited with bringing a strong, empowered female to the big screen. What type of feedback do you get from women? The response is so beyond anything I could imagine. On a daily basis, people always come up and congratulate me on bringing girl power to the screen, and that makes me happy. I love when parents of little girls tell me the character is a role model. Then, I was walking around on Halloween, and saw so many wearing a Rey costume, which was also empowering. 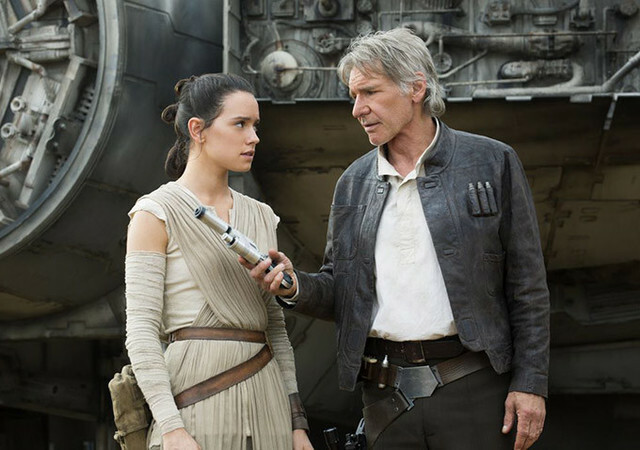 You’ve said that Harrison Ford — your co-star in “The Force Awakens” — reminds you of your dad. In what ways? They both have an earring and are both awesome. I felt right at home with Harrison on the last film because he was so supportive. Like my dad. What do you remember most about working with the late, great Carrie Fisher? She was so kind to me. She didn’t sit me down and say, “This is what you need to do.” But she did tell me to enjoy my success. And that was a wonderful thing to tell someone. She also showed me how you can really enjoy your work. That lesson I learned by just watching her. How do you rev up for big action scenes?